Item number DS403 - Gemini - Image © Digital Sky LLC. Gemini is another large and prominent winter constellation. 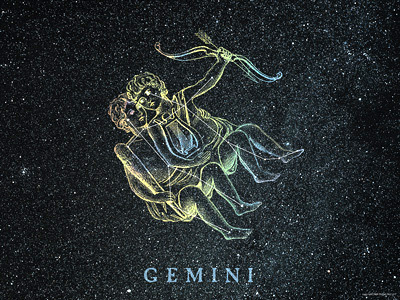 Crowned by the two bright, first magnitude stars, Castor and Pollux, Gemini is located along the star-rich Milky Way and is the most northerly of the zodiacal constellations. It is best seen from December through May in the northern hemisphere. The bright star Castor is unusual because it is actually three sets of stars, each set is also a double star. Castor A and B can be seen as separate in modest telescopes, since they are only about 3 arc sec apart. Castor C is about 9th magnitude and 73 arc sec away to the south. It takes a spectograph or a Space Telescope to separate the components of the double stars.